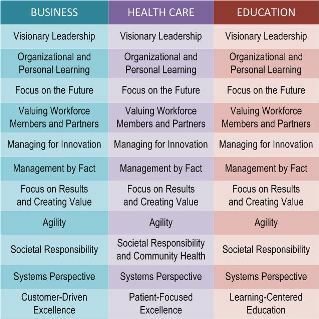 "What are the KEY factors that motivate them [WORKFORCE] in accomplishing your MISSION and VISION?" "What role do these suppliers, PARTNERS, and COLLABORATORS play in your WORK SYSTEMS?" "What are your KEY mechanisms for managing relationships with suppliers, Partners, and COLLABORATORS?" "What role, if any, do these organizations [suppliers, PARTNERS, and COLLABORATORS] play in your organizational PROCESSES?" Note: The term "KEY factors" has been replaced with "KEY elements" in the Organizational Profile.